"PURE MAGIC" a Walk in the Comeragh Mountains. The fog was down to the water’s edge in Dungarvan harbour when 6 brave hill walkers gathered, expecting a foggy walk with no visibility. We drove to the Nire Car Park and started walking the track towards the Gap in a complete blanket of fog. As we approached the Gap, the fog started to clear and we could see, higher up on Carrignagower, that it was blue sky and sunshine peeking out through the fog. We climbed through the fog and within 5 minutes we broke out into the bluest sky and sunshine. The clearest day of sunshine so far. 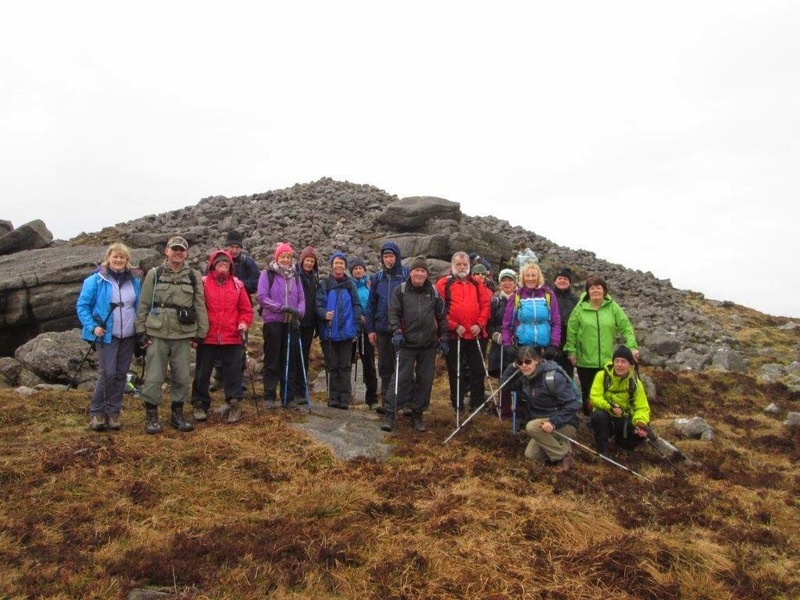 Ten walkers faced milk hill in the Monavullagh mountains on Sunday. Just over 12Kms and a maximum height of 600m. Great views of the Nire valley, Seefin and down towards Dungarvan. Registration Open from 17.00 - 18.30hrs. The C walk schedule on the web page is correct. Earlier printed versions were reversed. and Carrigavrantry Lakes near Fenor on Thursday 29rd October 2015.
site of the Early Bronze Age. The planning for the Christmas Celebration 2015 is under way. Tickets will be on sale soon at a cost of €25. We are hoping to arrange a walking weekend away in the Wicklow Mountains on the 23rd / 24th April 2016. I will be looking for people prepared to lead B & C walks. If you can help please let me know. If you feel the need to lead a walk, please don’t wait to be asked, volunteer your services to a coordinator. If you have a location for a walk just out of our usual area please let us know, we have one so far and will organising it for a Saturday or Sunday in January. Feel free to lead one yourself and we will help. The club walk on the 9th August, 2015 had a small turnout of 3 walkers in total. Since the weather was poor we did a four hour walk at a good pace taking in Seefin, Casey’s Road, Barnamadra Gap, and Carrigaline from the Mauma Road. We covered a distance of 16 k. approx. and the three of us were happy with a good work out at a strong pace. The monthly schedule from September onwards will now include an A walk. I have asked some accomplished B walkers to up the calibre of their walks to make them a bit more challenging, so giving the opportunity for members to give them a go, indeed some of our B walks were already at an A standard so it is also a bit of a reclassification. We shall also try and get an Easy B walk on the sheet once a month to give a greater variety of walks for members to try. Reenie Palmer is becoming the Thursday afternoon C style walk coordinator, any offers to lead walks should be directed to her on 087 122 4040. She is taking over from John Browne who has done a magnificent job for the past 5 years or more. Well done and thanks for your hard work. The AGM is at 20:00 on 6th October at the Park hotel Dungarvan. The agenda is available on the website and also sent by email. Notice is hereby given of the Dungarvan Hillwalking Club AGM, which will be held on Tuesday 6th October 2015 at the Park Hotel, Dungarvan, at 8pm. All members are cordially invited to attend and new members are most welcome. The Agenda for the AGM is as follows. 2. Approval of Minutes of AGM 7th October 2014. 8. AOB. For the retiring committee, taken from the floor. The following officers will be elected at the AGM. Walk Coordinators, A, B and C.
12. AOB. For the new committee, taken from the floor. We hope that you will be able to attend and look forward to seeing you on the night. If you participate in a walk would you please consider writing a very short report for the news letter? Anything would be gratefully received. The amount raised for the West Waterford Hospice is €1500, and will be presented to them at the start of the AGM on the 6th October. The weather just held out for a very pleasant evening at Maries house on the 18th July. Thanks to all who contributed in making the event such a success. Over €100 was added to the total of the Comeragh Crossing donation to the West Waterford Hospice. Over 120 men, women, children and dogs crossed to the Cunnigar spit on Sunday 2nd August. With John at the helm and wind and tide in fierce competition, every one made it across safely. At the Tigh An Cheoil public house refreshments were available, and as it was the oyster festival the same weekend the local GAA ran a barbeque and musicians were in session. The weather also good to us, although windy it did stay dry, with everyone in good spirits a magnificent €701 was raised for the Dungarvan Lions club. Well done to all people involved in making the event such a success. We will be voting on a change to the constitution of the club to allow us to hold committee meetings as and when required, at present meetings have to be two weeks prior to the club night, which can be demanding on peoples time. Secretary. Membership Secretary. Chairman. Ordinary Club Member. A selection of emails received. 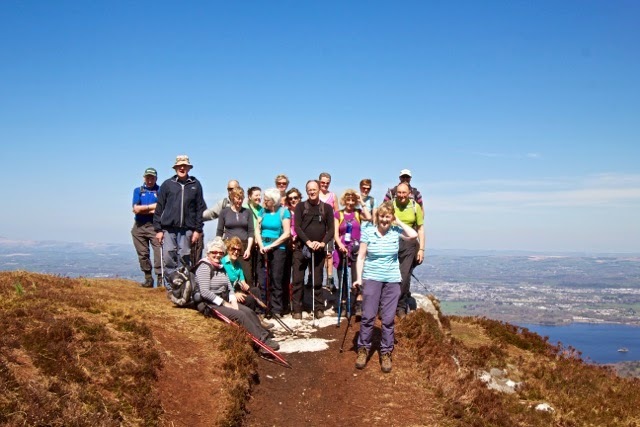 Just wanted to say a big thank you to you and the Dungarven hillwalking club for organising the Comeragh challenge. It was a great event, extremely well organised, and everyone at the administration points, bus and checkpoints were very friendly and helpful.The legs weren't bending at the ankles this morning, but thankfully they are now back to normal. I met some great people along the route and intend to take part again next year. Wishing you all best of luck today. Sorry I can't be with you this year - will be missing the Challenge and all the familiar Points and Faces. Hope its a great success. 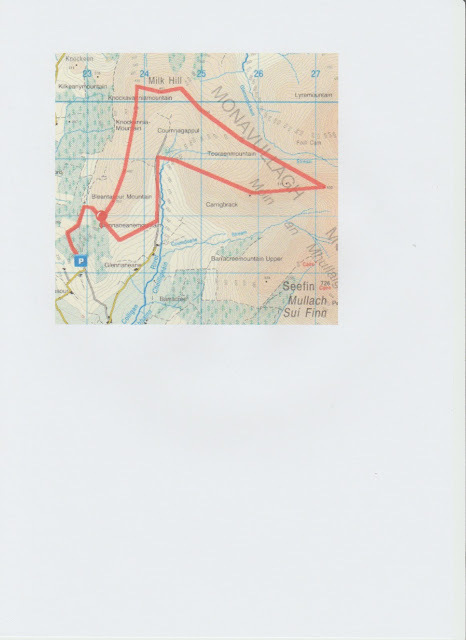 I took part in the Comeragh Crossing on Sat. I would like to thank you all very much for organising a great day. Everyone was so nice and friendly and all was so well organised. We didn't fit on the bus so a very nice gentleman from the club drove us to the start, I'm sorry I don't know his name. I loved the walk and was so happy that the weather was so good I was able to appreciate the views . The food and coffee were very welcome. If I had known about them I could have carried a lighter rucksack!! The food at the finish was lovely. A thousand apologies. I was so busy in work etc I never saw this reply til now. I am just waiting for the train after my weekly visits to dad. I was extremely impressed with the entire event and if you could hear all the glowing comments from fellow walkers your ears would be burning and you would be glowing. Everyone I talked to bar none had wonderful praise for the organisation of the entire weekend. Ps I am unfamiliar with the challenge etc. whilst I know I should be better with the compass I like the socialibilitity of the walks and perhaps was better off doing as I did. A big thank you to all the club members and non members, who contributed to the Annual Comeragh Crossing, making it a great success and the biggest so far. 260 walkers took to the hills and all but a handful completed their walks. The weather was kind to us and the new finish venue seemed to go down well. Supporting the Dungarvan Lions Club the Annual Cunnigar Crossing will take place on Sunday August 2nd. The meeting place is the TSB car park and we will depart from there at 1:30pm prompt. After the walk, we will repair to Tig An Cheoil Pub for refreshments and a collection for the Dungarvan Lions Club. Remember to bring a change of foot wear as it can get very mucky. The Annual Holiday Abroad on September 12-19th is to Tenerife. This was the destination of the first club holiday abroad. As it's the 20th Anniversary of the Club, a return visit was decided. To find out more about the holiday and the walks planned, contact Tony Fitzgerald. The AGM is set for the 6th October at the Park Hotel. Some vacancies on the committee will become available so we thought we would start early to try and fill them. Please volunteer early to avoid disappointment, or consider any post if approached. The jobs are not as daunting as they may seem. Thanks. Signing in at Bridgie Terries bar and restaurant. The Pike, Killineen, 5 Kms East of Dungarvan. Map Reference. X 301 / 970. Allow time to sign in. The Annual Comeragh Crossing will take place on the 4th July. We are now looking for volunteers to help on the day. Please contact one of the committee if you want to help to make this event the success it has always been. It is a fund raising event for the West Waterford Hospice and we are looking for check point Marshals and Stewards. Supporting the Dungarvan Lions Club the Annual Cunnigar Crossing will take place on August 2nd. The departure date will be announced nearer the date as it depends on the tides. After the walk, we will repair to Tig An Cheoil Pub for refreshments and collection for the Lions Club. Remember to bring a change of foot wear as it can get very mucky. 12th June at the Cunnigar. We will meet on the course at 19.00. Cost 5 Euro. On Sun 31st May seven B walkers including 1 guest all the way from France headed for the Comeraghs and completed a circuit of Seefin from Mauma Rd finishing via Farbrega. Some described it as four seasons all in one, with hailstones and wind but mostly nice sunshine throughout. As this was his first time leading, our leader noticed after some time that he was being marked out of ten. 2 points were deducted for the Hailstones but later recovered for the Sunny Spot where we had lunch. (Isn’t that right Ger ? ). An enjoyable walk with some nice climbs and the distance covered was just over 15 Km. A troop of 14 C walkers sample the newly opened towpath that runs along the river Suir from Clonmel to Carrick on Suir. A bus brought the walkers from Carrick to Clonmel and after sheltering from a short squall, they set off on the 18km route. The walkers escaped the worst of the showers and most of the walk took place in brilliant sunshine, but the grass was high at times and they had to beat it back with their sticks. The walk took five hours in total, but the walkers broke for an excellent lunch in Kilsheelan provided by James O'Donnell and his team of beautiful assistants. Many thanks to James for his generosity and hospitality. Signing In Desk Receptionist. Early start. No pay. Sit down job. Free dinner. Act fast to secure this sought after position. Chip Depot Marshals. Healthy outdoor job meeting interesting people, Bring your own flask. Dinner included. Catering Executive. Long Hours. Hard Work. Free snacks and tea all day. Free dinner if still hungry. Various Other Vacancies Available. Apply within.